Now, a collaboration led by the U.S. Department of Energy's Brookhaven National Laboratory has discovered a surprising breakdown in the electron interactions that may underpin HTS. The scientists found that as superconductivity vanishes at higher temperatures, powerful waves of electrons begin to curiously uncouple and behave independently—like ocean waves splitting and rippling in different directions. "For the first time, we pinpointed these key electron interactions happening after superconductivity subsides," said first author and Brookhaven Lab research associate Hu Miao. "The portrait is both stranger and more exciting than we expected, and it offers new ways to understand and potentially exploit these remarkable materials." "We know charge and spin lock together and form waves in copper-oxides cooled down to superconducting temperatures," said study senior author and Brookhaven Lab physicist Mark Dean. 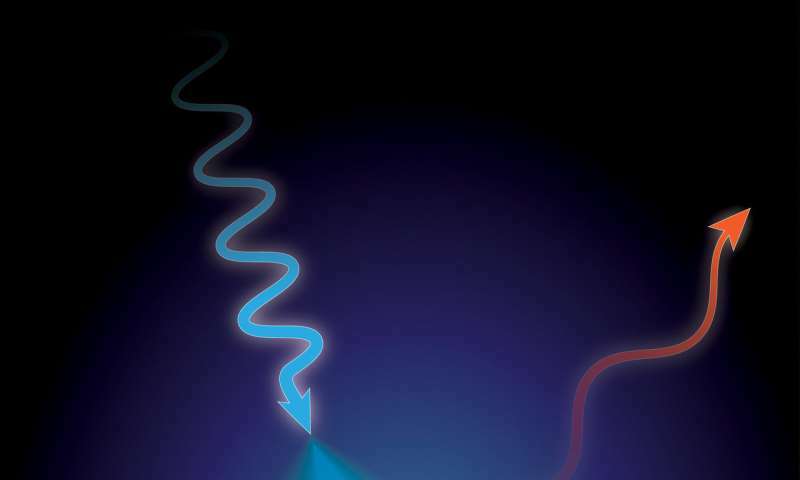 "But we didn't realize that these electron waves persist but seem to uncouple at higher temperatures." Scientists at Brookhaven Lab discovered in 1995 that spin and charge can lock together and form spatially modulated "stripes" at low temperatures in some HTS materials. Other materials, however, feature correlated electron charges rolling through as charge-density waves that appear to ignore spin entirely. Deepening the HTS mystery, charge and spin can also abandon independence and link together. "The role of these 'stripes' and correlated waves in high-temperature superconductivity is hotly debated," Miao said. "Some elements may be essential or just a small piece of the larger puzzle. We needed a clearer picture of electron activity across temperatures, particularly the fleeting signals at warmer temperatures." "We can't have any structural abnormalities or errant atoms in these cuprates—they must be perfect," Dean said. "Genda is among the best in the world at creating these materials, and we're fortunate to have his talent so close at hand." "We turned to the European Synchrotron Radiation Facility (ESRF) in France for the key experimental work," Miao said. "Our colleagues operate a beamline that carefully tunes the x-ray energy to resonate with specific electrons and detect tiny changes in their behavior." "This indicates that their coupling may bolster the stripe formation, or through some unknown mechanism empower high-temperature superconductivity," Miao said. "It certainly warrants further exploration across other materials to see how prevalent this phenomenon is. It's a key insight, certainly, but it's too soon to say how it may unlock the HTS mechanism." That further exploration will include additional HTS materials as well as other synchrotron facilities, notably Brookhaven Lab's National Synchrotron Light Source II (NSLS-II), a DOE Office of Science User Facility. "Using new beamlines at NSLS-II, we will have the freedom to rotate the sample and take advantage of significantly better energy resolution," Dean said. "This will give us a more complete picture of electron correlations throughout the sample. There's much more discovery to come."